Cheesy Sour Cream Chicken Enchiladas recipe that makes for an easy, delicious weeknight meal – especially for a Mexican food night! In case you never noticed before, Mr. Wishes and I are major Mexican food junkies and I cook it up at least once per week for lunch or dinner. These amazing enchiladas are the epitome of real comfort food and some of the best Mexican food I’ve made in my kitchen in a while…even your kids will love them! 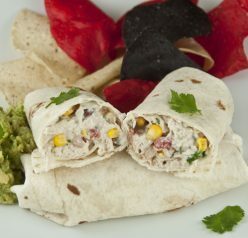 The sour cream definitely enriches the sauce to a point where it’s simply irresistible. You can even opt to use Greek yogurt to make this ten times healthier without altering the taste too much. That’s probably not actually accurate, but you get the point. Personally, I prefer to use the sour cream and “splurge” a little. 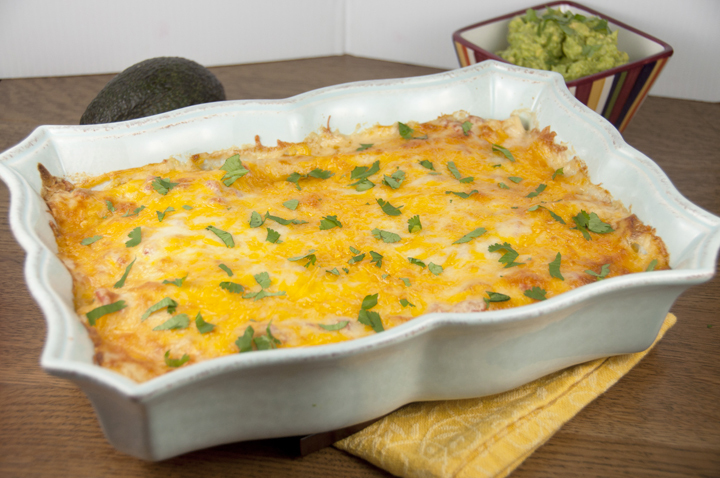 Oh, and if you like these, you’ll LOVE these awesome Honey Lime Chicken Enchiladas. 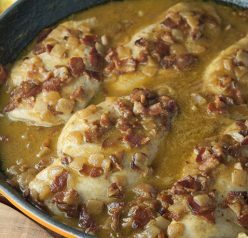 They are my are my hubby’s favorite meal of all time and be constantly begs me to make them! I officially make them for every birthday of his alongside my homemade guacamole. I told you that Mexican food was our favorite! I served these enchiladas with chips and my fresh guacamole recipe. I get so many compliments on these enchiladas and it’s really for a good reason. They are simple to throw together, loaded with cheese, and one of those recipes that’s great for all ages. I highly doubt you will have any complaints at the dinner table for this one! Everyone I know who has made these Sour Cream Chicken Enchiladas just raves about these bad boys. I hope you give them a try soon as you will not be disappointed! 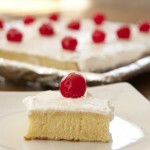 They are comfort food at it’s finest and totally worthy to serve to company. Add broth and whisk together. Cook over heat until it’s thick and bubbles up. Pour mixture over enchiladas and add remaining 2 cups of cheese to top. Bake in oven for 20-23 minutes then you will want to broil for 3 minutes to brown the cheese. Enjoy! I could eat Mexican food every day! These look delicious!! Oooh, look at this cheesy goodness! Must. Eat. Now. Holy yumminess – those look awesome! I should totally try this with vegan sour cream and without the chicken. I love the idea of using sour cream IN the enchiladas and not just on them. We love enchiladas and these look fantastic, ooey and gooey which makes them even better. Nice recipe and so simple. I’ll have to check out your hubbys favorite Honey Lime Enchiladas. I have the same Pampered Chef bowls, they’re great, aren’t they? Thank you, Vicki!! I love those pampered chef bowls. These look like cheesy perfection! Glad I’m not alone! haha! We love Mexican food, too. Not every week, but often. Enchiladas are so tasty, aren’t they? Love this version of them! Such good stuff — thanks. Yes I love them! Thanks, John!! I LOVE to make homemade enchiladas! These look fantastic Ashley! Such a quick and easy, cheesy, yummy dish! Oh gosh, we are huge mexican food junkies too! I make mexican something or other at least once a week too! 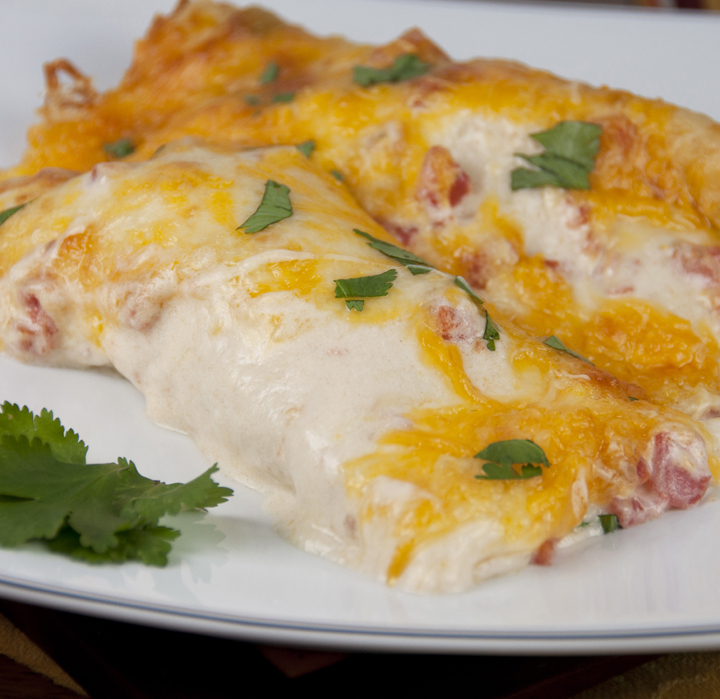 These look purely awesome – I need to try adding sour cream to my enchiladas next time! Thanks – they are sooo good!!!! Love a creamy enchilada. This looks so delicious. I love Mexican food too! These enchiladas look amazing Ashley! I love Mexican food too! These enchiladas are gooey perfection! California has the best Mexican food!!! 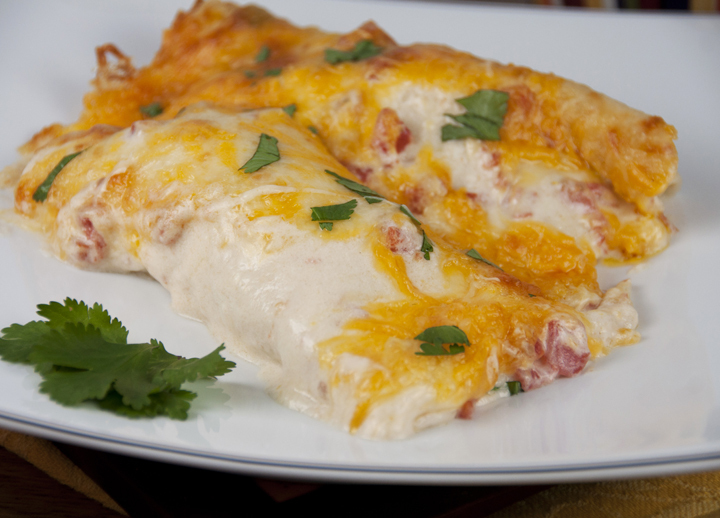 Enchiladas are very popular in our home and these look like they would be a delicious addition! 🙂 The hubby and I are big fans of Mexican food so I know he’ll love these. 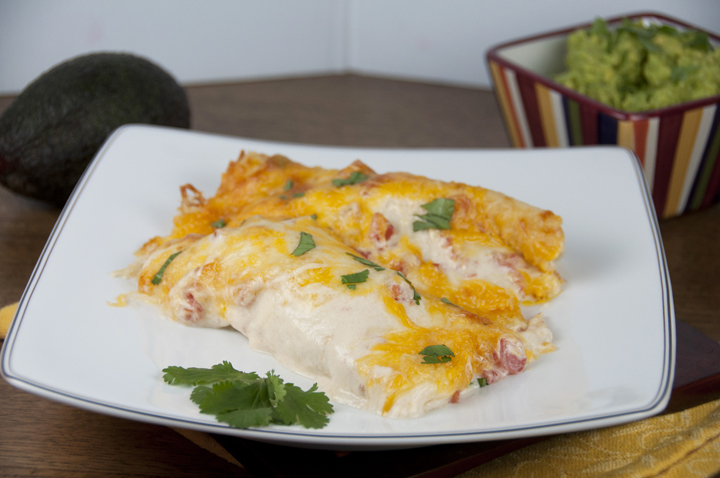 chicken enchiladas are a great comfort food! These look yummy! There isn’t a good Mexican restaurant nearby and I’ve been building my “better than take-out recipes.” This will definitely be included. Thanks! Ashley, I could eat this meal several times a week and never tire of it! The ultimate in Tex-Mex comfort food, for sure. I love all that melty cheese in your photos. It’s calling my name! Thanks for sharing! I found this on Pinterest and it looks amazing! Fairly easy to make, too, which is a big plus in my book! I love your recipes please send me more!!! I made this for my family tonight and everyone loved it! My boys, who are very picky, devoured it. So delicious! Great job, Ashley! Katy, I do think the Rotel makes a big difference!! I’m so glad you liked them!! Ok I made this tonight for 8 guests and they all loved it!! Thank you so much for this recipe. It’s great to just do it differently every once in a while because I usualy use corn tortillas, minced meat and enchillada sauce. It was great!! I make these only I use a can of Cream of Chicken soup mixed with the sour cream… I also cook the chicken down in the can of Rotel until it absorbs all the liquid from the rotel… then I chunk the done chicken breasts over in my Kitchen Aid stand mixer with the beater on medium and within minutes they are shredded. Wha-lah! Took me awhile to perfect this recipr but it is awesome!